[Private Tour] AKB, maid cafes and consumer electronics! See signatures of the AKB48 members at the AKB48 Cafe & Shop. Enjoy a cup of coffee at a maid cafe, where you will be called goshujin-sama (my master) by the maids. Shop in the biggest cosumer electronics store in Tokyo, Yodobashi Camera Multi Media Akiba. 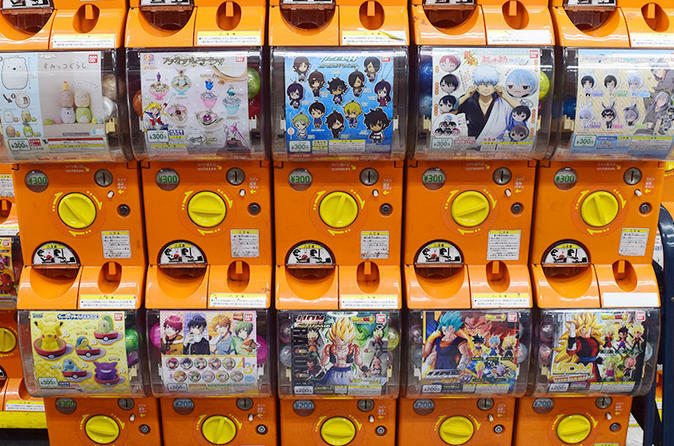 Enjoy Japanese subculture, such as gachapon and anime figures! This is a store that sells massive amount character goods from popular anime and movie. The good have various type of ganre, so you will never get bored! AKB48 is one of popular Japanese idol groups. Since their home town is Akihabara, you can visit concept cafe and buy various goods related to AKB48! Get to know more about Japanese idol! You can get anything in Akihabara, but also you can get anything in Don Quijote too! It's a biggest discount store in Japan. They sell original parti goods and costume as well! Have you ever heard Japanese Gatya-pon? You can get a plastic ball with a good fit in your hand, but you never know what is inside. There are more than 300 different types of Gatya-pon. Worth to try it! When you asked about Akihabara, what would you tell? Maid cafe would be one of the answers. This maid cafe is only in Japan and you have never seen before! Among the Anime and Game culture town, Akihabara is also enriched with game center! Akihabara is a city well-known for PC parts and electronic goods. Let's close the tour in the shop where all electronic goods can be found. Highly quality Japanese goods can be purchased here!